The Duluth office of SiebenCarey is one of three personal injury offices located throughout the state of Minnesota. 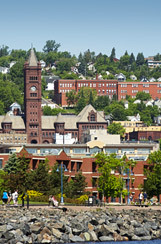 You'll find our Duluth office in the Duluth Technology Village on Superior Street in downtown Duluth. Follow Interstate 35 into downtown Duluth; at exit 256B take the ramp right for 5th Avenue to Lake Avenue; turn left on Lake Avenue to 11 East Superior Street. Follow Hwy 2/194 into Duluth; bear right on Hwy 53/S 194/Miller Trunk Highway; turn right onto US 53/Trinity Road; take ramp left for I-35 North toward Wisconsin; at exit 256B take the ramp right for 5th Avenue to Lake Avenue; turn left on Lake Avenue to 11 East Superior Street. Follow Hwy 61 into Duluth; turn left onto I-35 south; at exit 256B take the ramp right for 5th Avenue to Lake Avenue; turn left on Lake Avenue to 11 East Superior Street. Any type of injury on the road, including car accidents, truck accidents and motorcycle accidents. Also those hurt in bicycle or pedestrian accidents. Our personal injury lawyers have experience with all other types of accident claims, including premises liability (home accidents), defective products and slip-and-fall, to ATVs, boating, snowmobiling and construction accidents. Injuries that occur while on the job are covered by Minnesota workers' compensation laws. Often it takes an attorney that focuses specifically on workers' compensation to insure you are compensated for medical expenses, long-term disability or job retraining. SiebenCarey is one of only a few personal injury firms that also has dedicated workers' comp attorneys on staff. Injury cases from improper or negligent health care are called medical malpractice and require lawyers with extensive experience, resources and trial skills. Our attorneys handle all types of medical malpractice cases, from birth injury to wrongful death. SiebenCarey also has personal injury law offices in Minneapolis and Lakeville,Minnesota.